Have you ever shared a recipe with your mom? How did that go? My mom taught me everything I know when it comes to Yemeni cooking .She cooks with her instinct. She knows the ingredients and mixtures by heart, so everything she cooked was with no measuring! 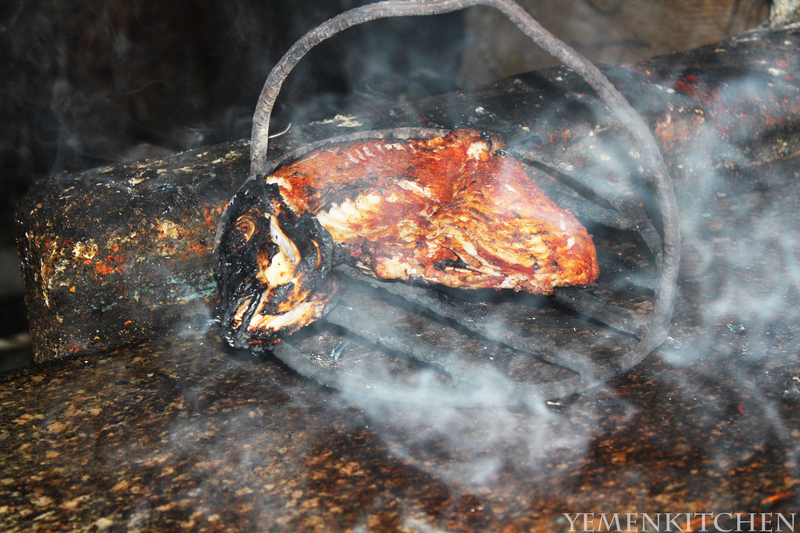 This was perfectly fine for her with Yemeni cooking because she knows it so well. I asked her to give me the Sugar Konafa recipe but it was a complete puzzle for me as I try as much as I can to go with measurements to get the same result every time.I had to repeat it over and over until (I think , I got a good grasp on how to do it). Sugar Konafa is different than the Middle Eastern Konafa that is well known in Lebanon and Egypt and most of Arab countries. It is not stuffed with cheese or cream or nuts or any of that sort. It is simply Konafa layers, Sugar, and butter (or Yemeni smoked ghee), and served warm and right away. 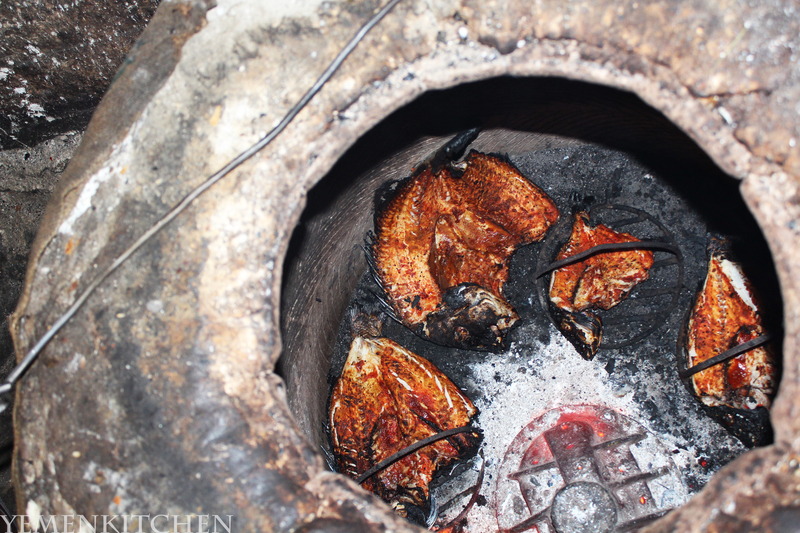 Since it’s served with Yemeni Stone dish it helps to maintain it warm for longer time. It totally reminds me with the simple French sugar crepes, where it cannot be eaten cold, or its taste is ruined. Sugar Konafa is the same thing. This dish comes from Ibb Region and known in some parts of Taiz and its surrounding, some likes it with Yemeni honey, but where I grew up, we love it just with sugar powder because it is lighter. The flaky Konafa layers melts with sugar and butter or /ghee in your mouth, always reminds me with great memories around the table and savoring its taste. 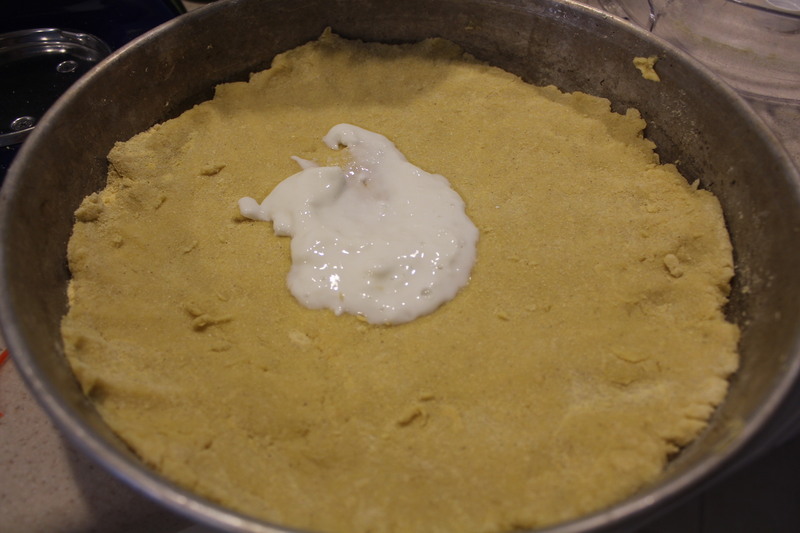 The mixture of the Konafa is so easy, but its technique is tricky. It’s exactly same ingredients of French crêpes, but needs to be lighter. When I tell people about it, surprisingly, many don’t know anything about it. What you need for Konafa is the Konafa cup which come with three small opened tubes at the end of the cup. If you don’t have the cup, that’s alright, you can empty a condensed milk can and make three holes at the center of one of its ends, and completely remove the lid of the other end, it will work just fine. Later you fill the cup with Konafa mixture and in circular motion you start making Konafa on your non-stick pan. This circular motion is 90% of the creativity of this dish. 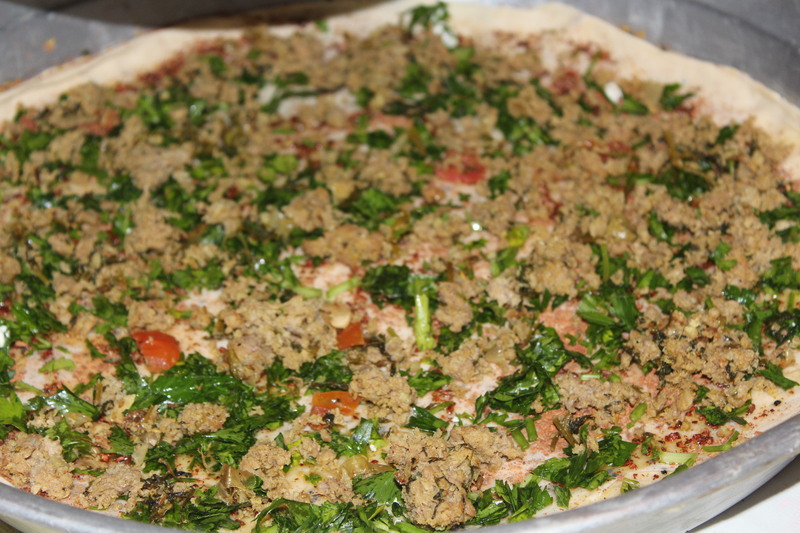 If you can tackle it then you easily mastered Konafa. It took me a while to get it right, but hey, taste is totally worth trying to make it. -Some Konafa cups or (your home made Konafa cup) in that sense might not get through the mixture as easily. There are many factors that could lead to that, either your cup size or the size of the tubes is not big enough. You need to test it before you start doing Konafa. Pour some Mixture to the cup, if it was getting out as dot then your mixture is thicker than it should, and therefore the tubes are not getting it out smoothly. So you should add more milk. 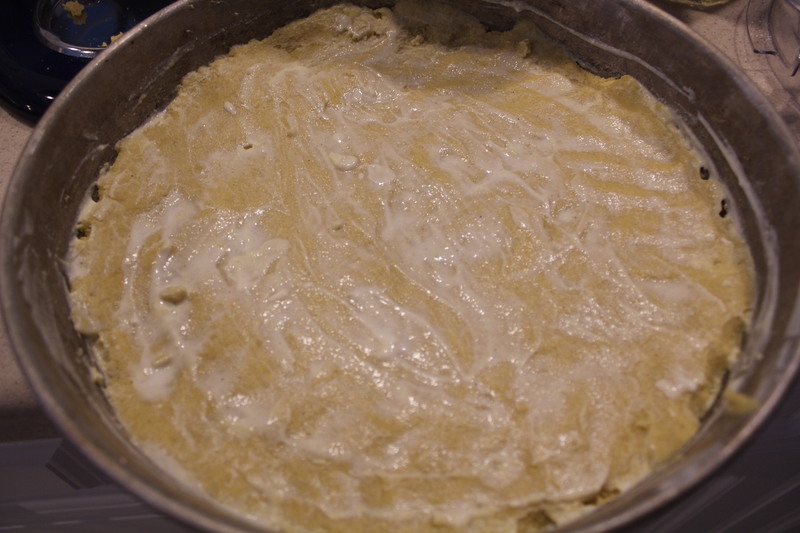 The mixture should flow quickly and smoothly , like you are running water through it , but be careful to get it super light , then your konafa will fail! As my mom would say, you should trust your gut when you do it, and keep trying, you will then know exactly what it needs. -After running the test let it sit for 15 mints. -Prepare the pan, dip in some oil in a kitchen napkin, and wipe the pan with it .let it heat on low temperature. Until it reaches medium heat. You can test the right heat by throwing a drop of the mixture to the pan and see if it dry quickly, then it’s ready. -Now add the mixture to the cup and move it with your hand to the center of the pan. Quickly get your hand from the center to the side of the pan in along circular motion. This will create circular stripes around the pan. Once you finish them, quickly make circular shapes around the stripes to close your Konafa. -Once you master your first Konafa, make sure the heat is still low, let it slowly dry up ,but make sure it still white in color. -Remove it when it’s still white, Konafa should be served white and soft .Never brown and crispy. -If you made your Konafa on a 12 inch pan then this batch is enough to make you around 15 to 20 layers of Konafa .You can freeze the extra if you want for the next time. 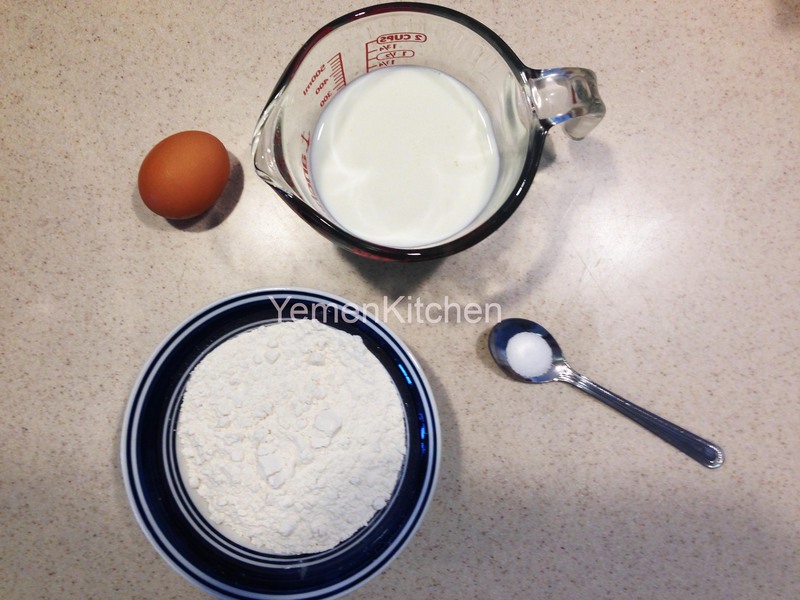 -Now warm the Yemeni Stone dish, with butter to melt on it while it slowly heats up. – Put 5 or 6 Konafa layers, add more butter on top and powder sugar. -Continue this process until you finish those layers. -Quickly move all the layers upside down, to warm up from the top. Make sure it doesn’t get dark brown, only light golden on its sides. -Garnish with some sugar powder and serve it right away. 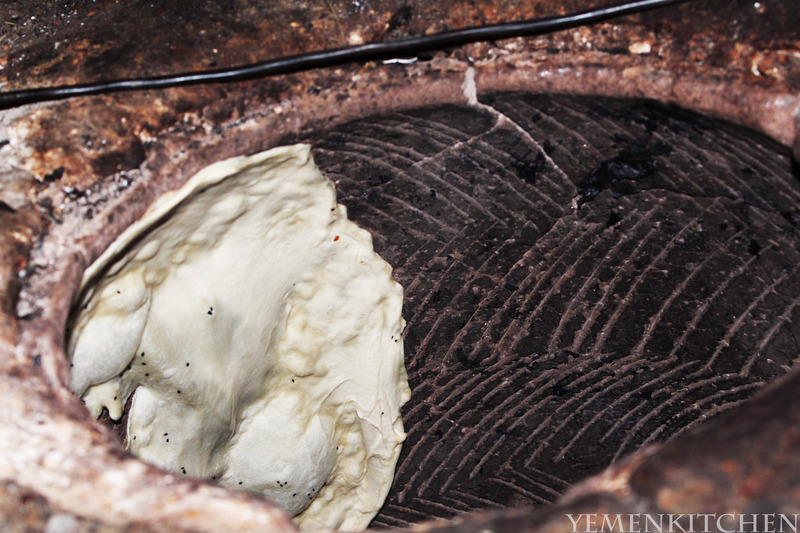 This dish is usually eaten as main dish in Yemen, but it can be served as a dessert or at the end of the meal too. 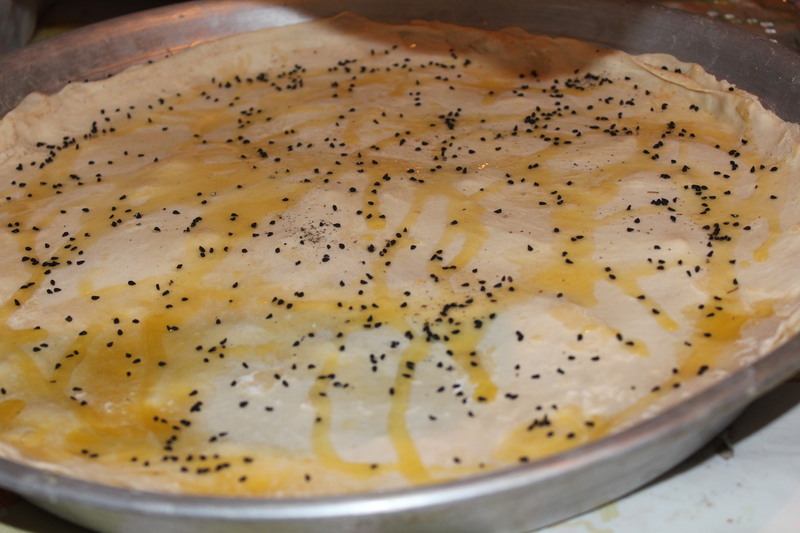 My husband inspired me to try make a fusion of Yemeni Konafa with different types of western desserts. So perhaps I might do that, and you can try that too, and let me know how it turned out. 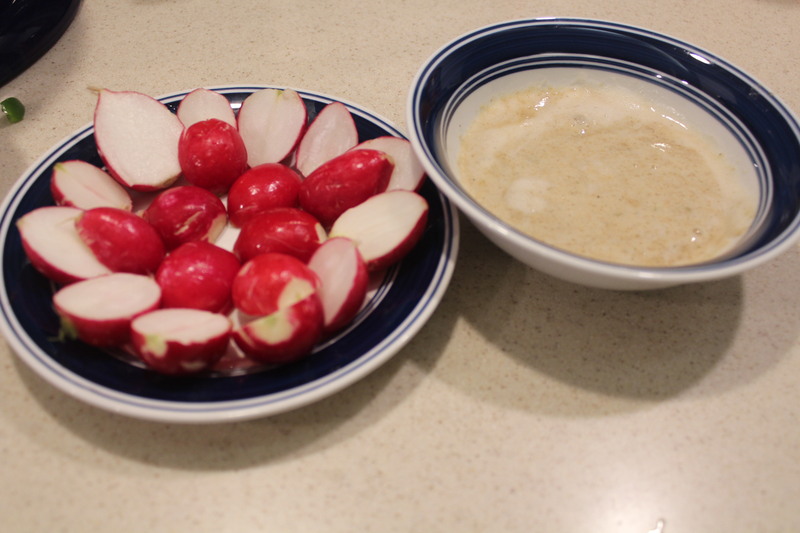 I decided to sneak some parts of Aseed post that is an essential to Yemeni traditional cooking in Ramadan.Its is the broth. 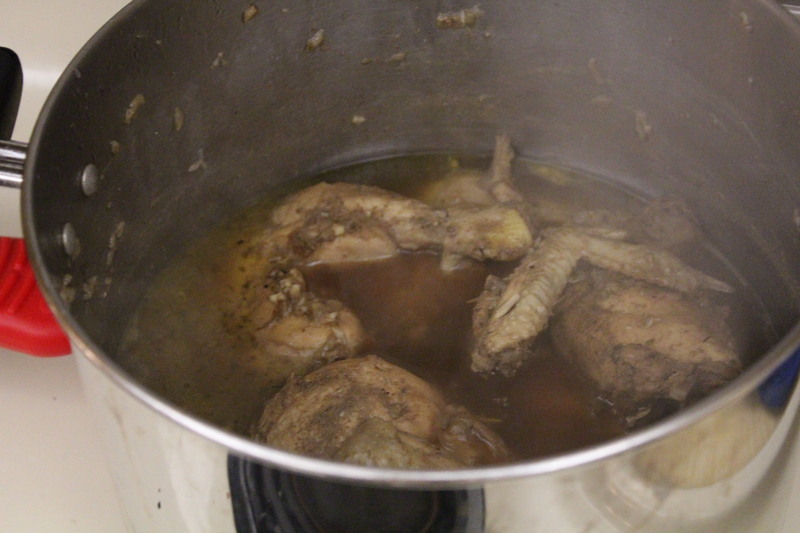 Chicken, or meat broth is used in cooking different soups,cooking rice with it, or with Saltah too. I felt it needed to be honored with a post on its own .You can use the same ingredients for Meat if you wish , but give it more time to boil and get tender. Wish you a good appetite! 1 whole Chicken with bones, cleaned with water and salt, skin and fat removed. -Follow with garlic and the spices, then the potato. 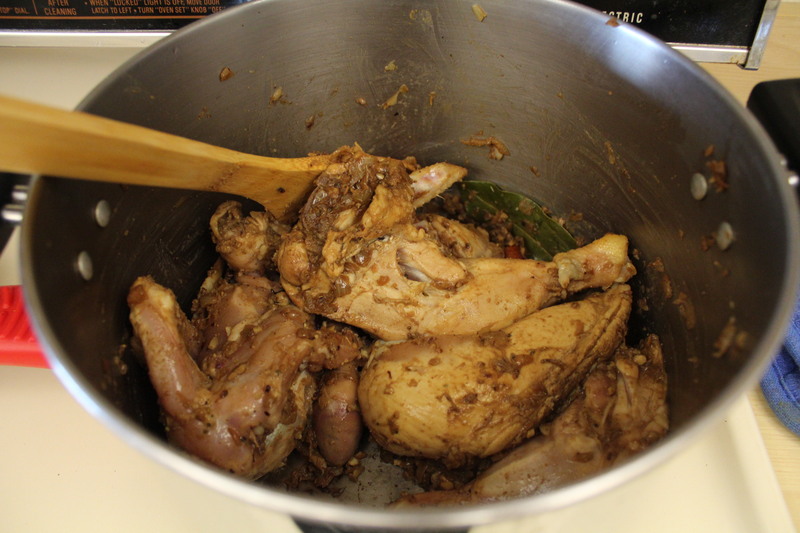 -Put the chicken pieces and keep moving them in the pot under the heat and follow with water. -Boil until chicken is tender and potato is soft. 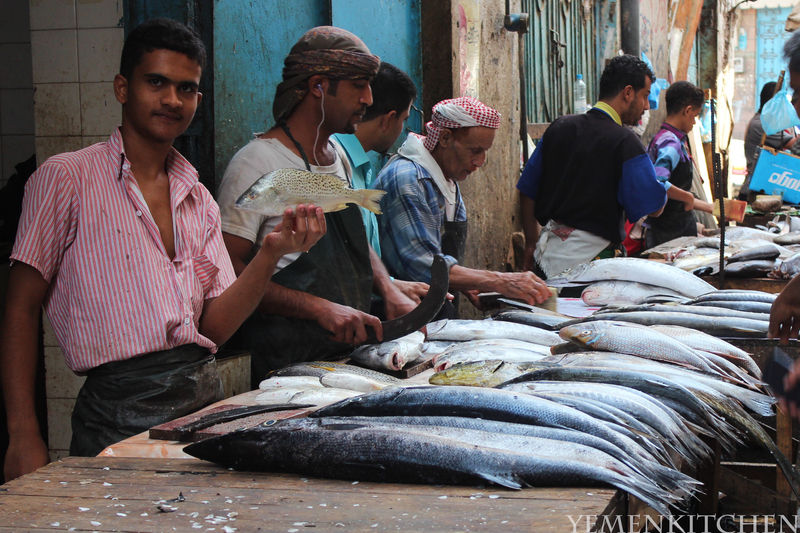 The most popular dish in Yemen, in one word,is Bent Al-Sahn ,or the “beauty of the table” as some would call it. I contemplated writing on Bint Al-Sahn in the very first articles in YemenKitchen, not because there is nothing else to say beside it super popular and it’s so delicious, but because it is one of the most obvious choices to write about, when it comes to food in Yemen.ts very similar to Boreck in its preparation, only its served plain with no filling,only honey on top. 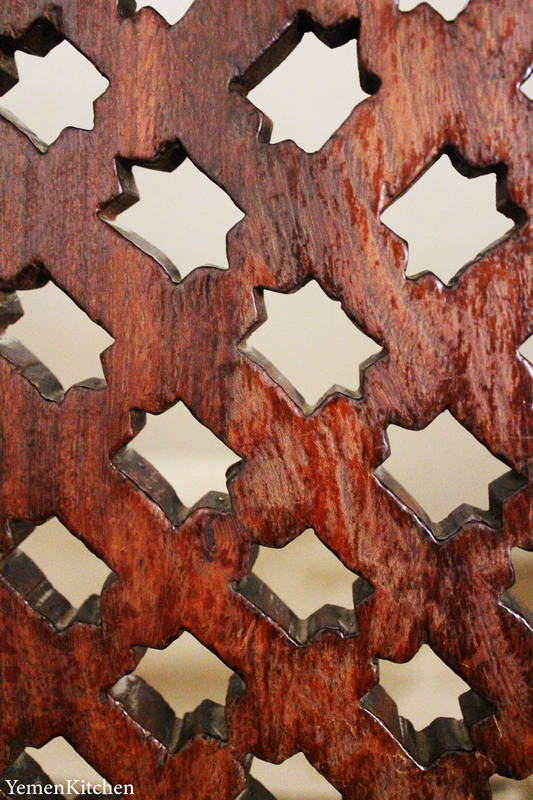 Bint Al-Sahn is usually served when having guests, or on Friday lunch when the bigger circle of family meet. It’s a dish made of buttery golden layers of thin dough, and honey, and garnished with (­حبة البركة ) )Nigella seed) that’s it. 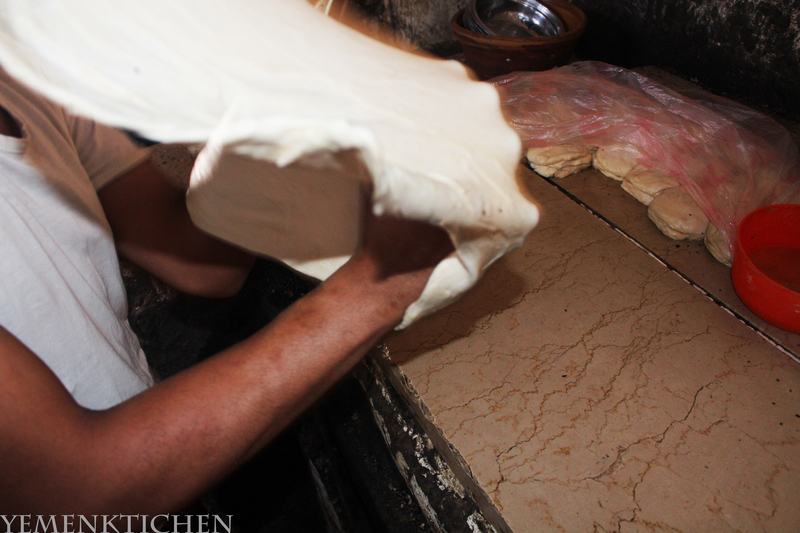 Bint al-Sahn is simple in its ingredients, its preparation however can be little tricky since you need to make those layers of dough from scratch. Once you master how to open up the layers and place them on top of each other in the dish, everything else is easy. 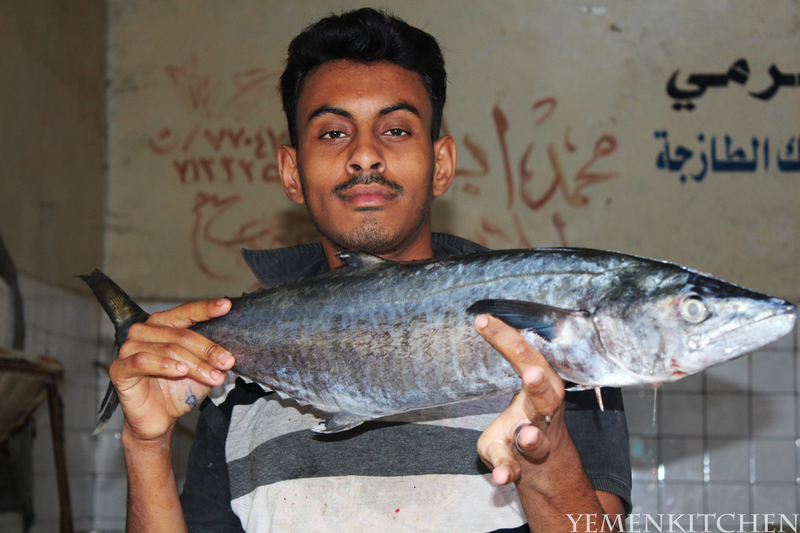 How this dish did became so irresistible, and held a very unique place in the Yemeni table?! 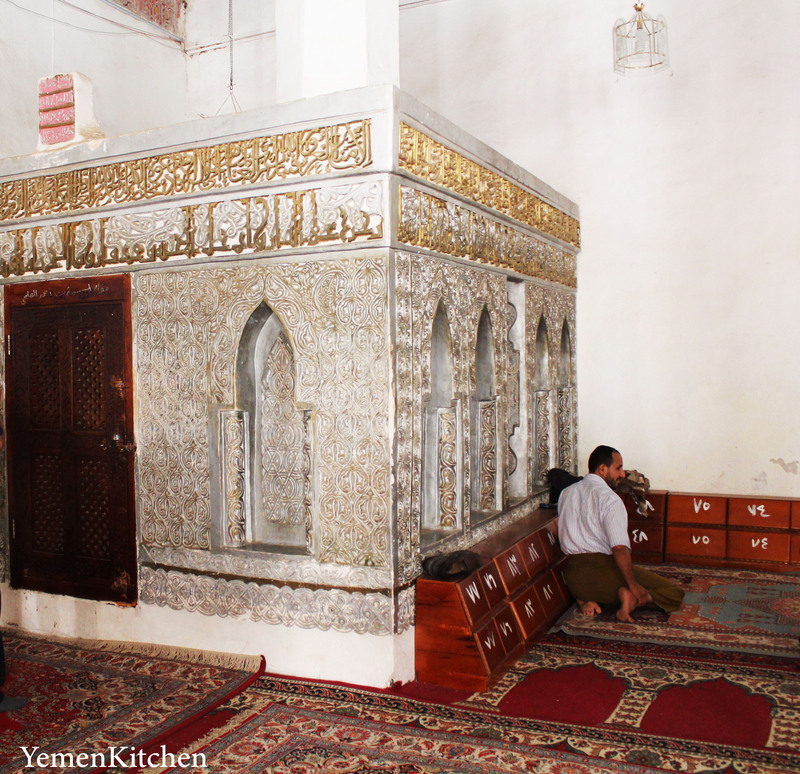 Bint Al-Sahn is classically served in the middle of the lunch, and not towards the end of it, which is surprising for people who are not accustomed with Yemeni food traditions. The more high status your guests are, the more expensive is the honey served with it .To honor the guest the head of the house will pour the honey in circular motion towards the guest side and to the middle of the dish, generously, so he/she won’t feel shy to take more of it. The guest, of course, knows that the host do that to honor them, so he must always try to stop them from pouring honey more than needed. It’s a delicate­ welcoming and thankful gestures done between the host and the guest to show appreciation and respect. For me Bint Al-Sahn was always associated with big family weddings that I attended with my mom and siblings. I was a shy kid, and I never enjoyed going to big lunches where the list of guests could go to hundreds. 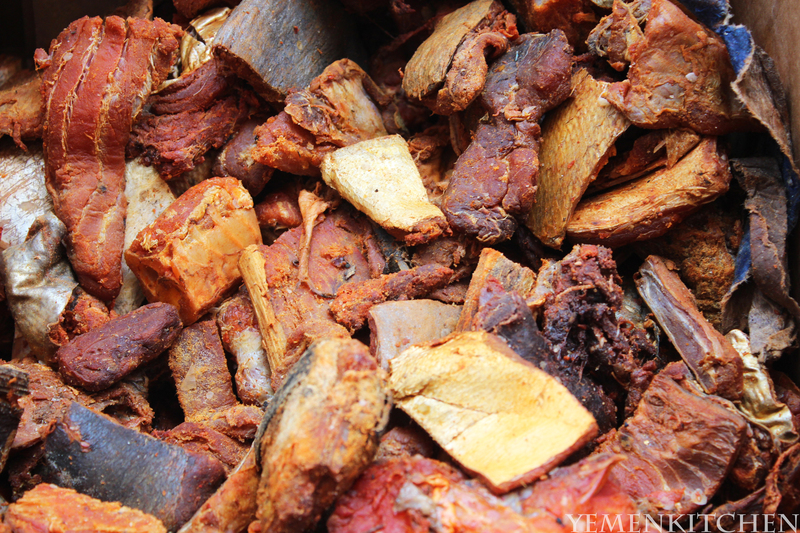 Eating bint Al-Sahn was the only thing that would make me stay patiently in the event, waiting until the gathering is finished and get back home. This kind of events were usually in the house of the event. It’s still a mystery for me how they were able to fit this amount of people in one place. Food would all be laid on the ground on a plastic fabric, with no chairs so they could maximize the space for more people to fit in and eat, more like you are in a picnic trip with few hundreds of people!! :) Of course,2/3 of them are somehow related to you in a way or another,Big Fat Yemeni wedding style.
. Bint Al-Sahn will always be my secret wedding rescuer, what is yours? -1 Egg at room temperature – 1/2 of whole milk -pinch of salt -1and 2/3 teaspoon of baking powder -2 cups of white flower -1 table spoon of cooking oil – 3 table spoons of butter and 2 tbl spoons of ghee , both mixed and melted together. Preparation Put all the dry ingredients together, make a whole in the middle and put the egg, and cooking oil in it and start kneading. 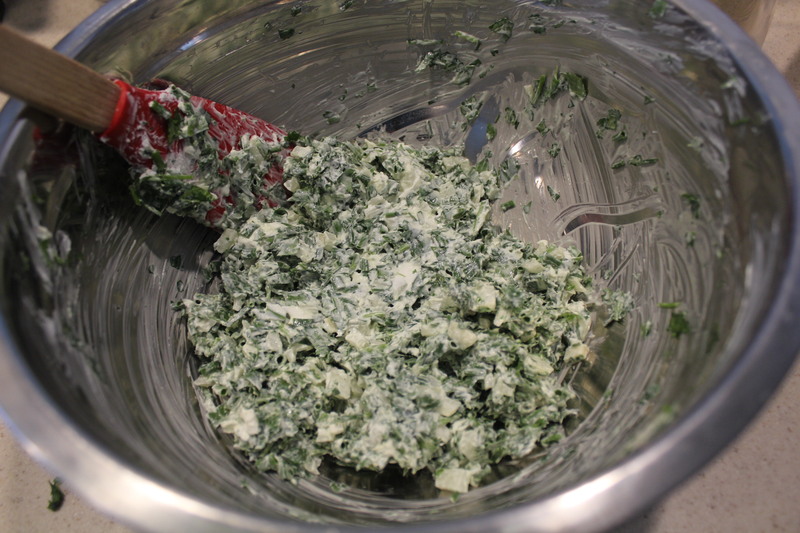 Add milk carefully and keep kneading until the dough starts to hold up and all the sides are cleaned up. Keep kneading for 10 to 12 mints. -The dough will be soft,drizzle few drops of oil, put it in a plastic wrap in a warm corner in your kitchen with no air drift towards it for about 30 minutes. -The dough should multiply in size .Now prepare the surface area for your dough by sprinkling white flour on a clean dish or on your kitchen counter top. Take the first dough and start moving it between your hands in a circular motion, more like how the infinity sign∞ looks like. 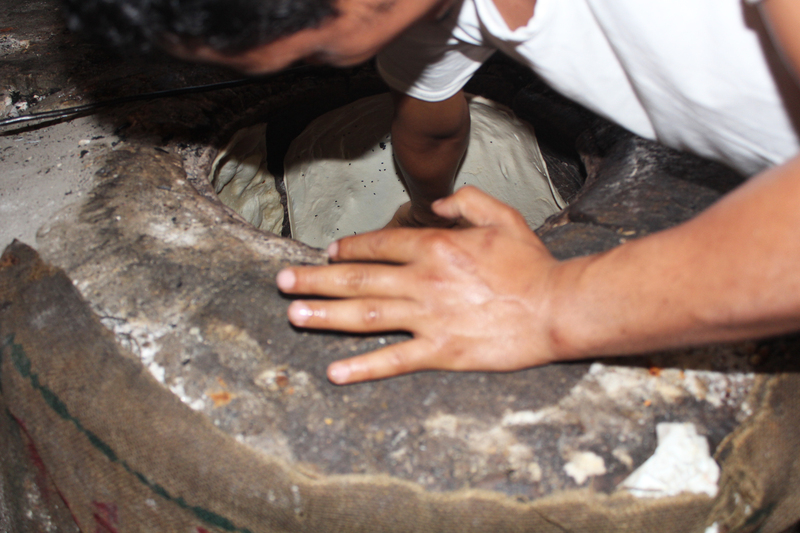 The dough will start getting larger and thinner , very similar to the Boreck dough. Put the dough quickly into the dish. Drizzle the ghee and butter mixture and start revolving the dish to both sides so the butter get to most parts of the dough. -Continue this process for the rest of the dough pieces. Until you create all the layers needed for bint al-sahn. Garnish the top with Nigella seed,(حبة البركة) put in the oven until it become golden from the top. Usually take 35 mints. Serve when butter is still oozing and drizzle honey on top. I didnt have the chance to cut it into traingles and make pretty pictures this time.Since the plate was finished , literally, seconds after serving! I would like to give all my followers a heartwarming congratulations on Ramadan. 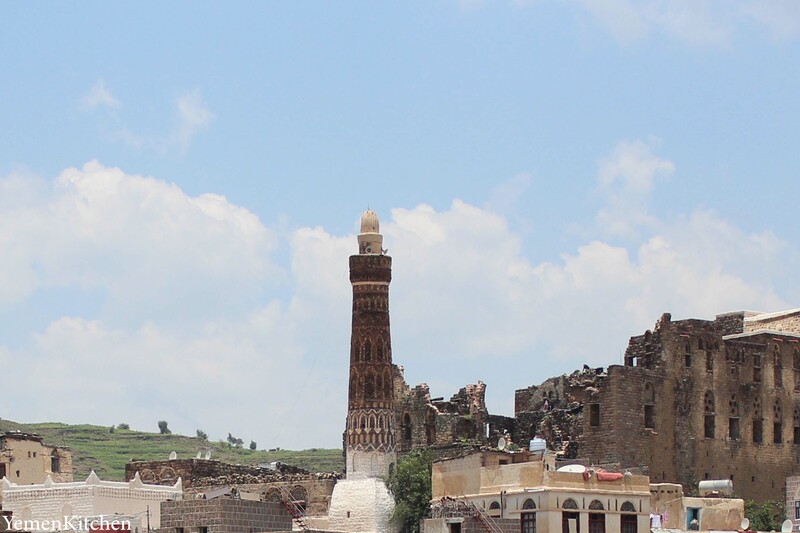 This month is dear and near to my heart for many reasons, one of them is that it reminds me a lot of the old good days when I was a kid growing up in Taiz, Yemen. We had blast in Ramadan, .It was the time to break rules such as eating endless amount of sweets, staying awake late at night until the very first light rays of the next morning, and going school late and leaving early .To give you a closer picture , it’s like a whole month of Christmas on steroids!! Each year, I take this month as a time to reflect on my life and become more spiritual. 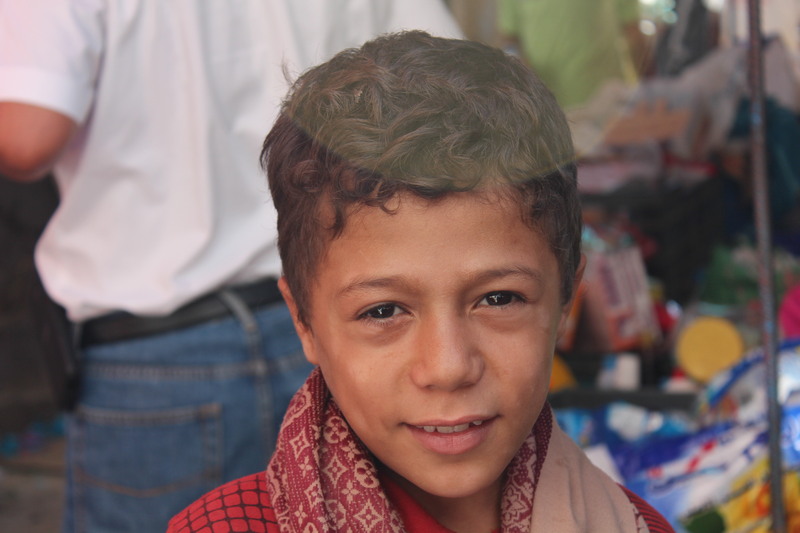 I can’t help but also to wish that Yemen, will hopefully find peace and become a better place for its people. 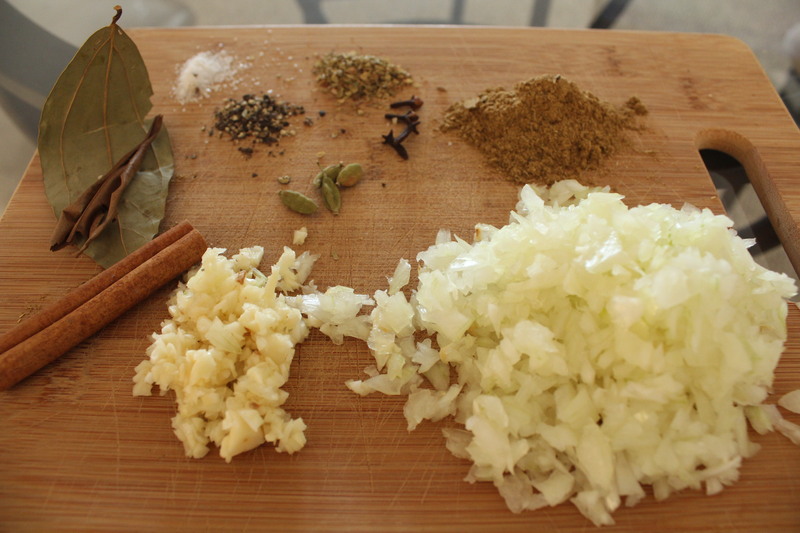 I decided for this month to be posting brief diary on my adventures in the kitchen in Ramadan, some recipes might not necessarily be Yemeni , as much as I love Yemeni food, I totally love to dive into trying new flavors and new recipes. 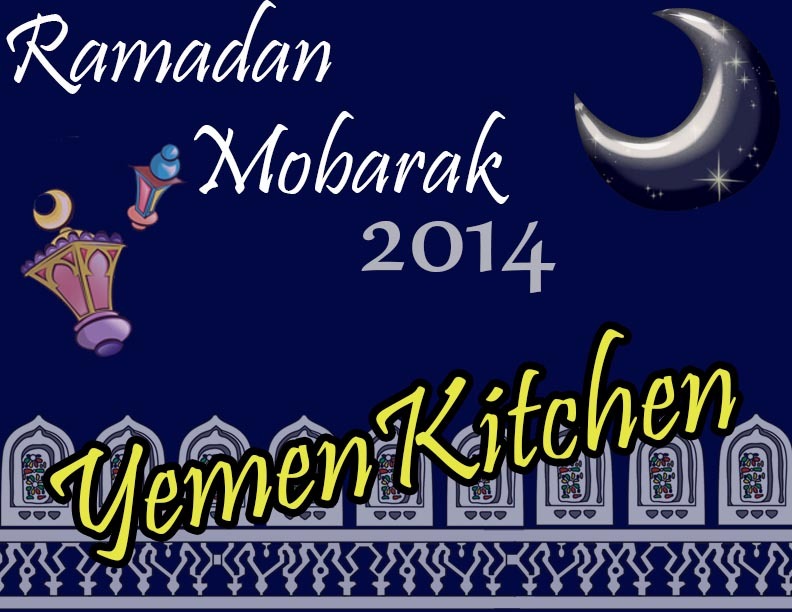 I will also try to share more of Ramadan stories that are more related to my life back in Yemen, and Jordan,and here in the U.S,just to keep with the cultural theme that I started in this blog, so if you have a memory related to Ramadan, and food , that you would like to share in the Yemenkitchen space feel free to put it down this post or through twitter as well @YemenKitchen. 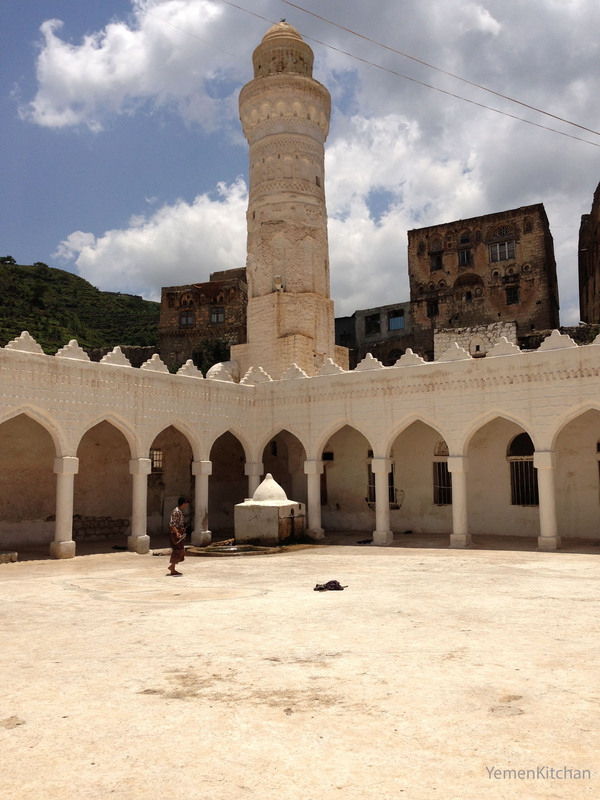 In the mean time , you can hear my interview with Yemen Peace Project that I did on Ramadan 2013 and learn more about Ramadan rituals. 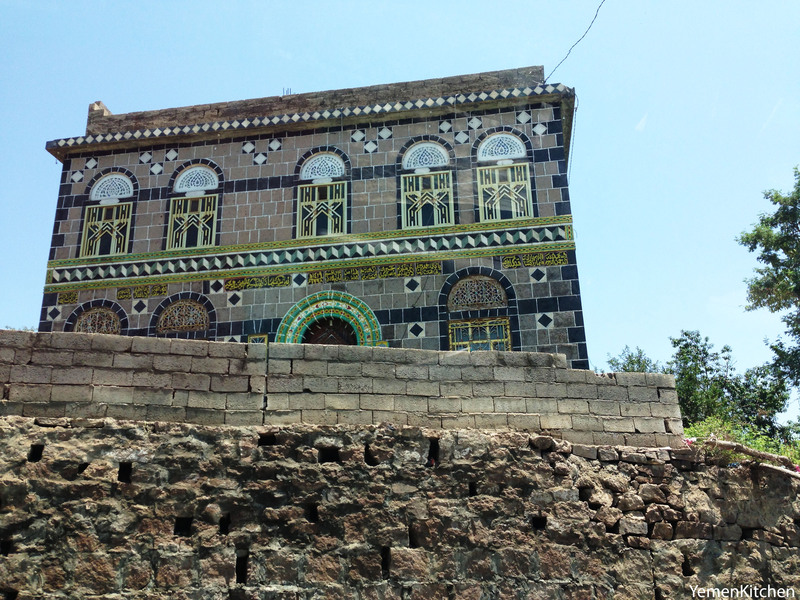 If you happen to travel by car from Sanaa to Taiz, Ibb will be the highlight of your trip. 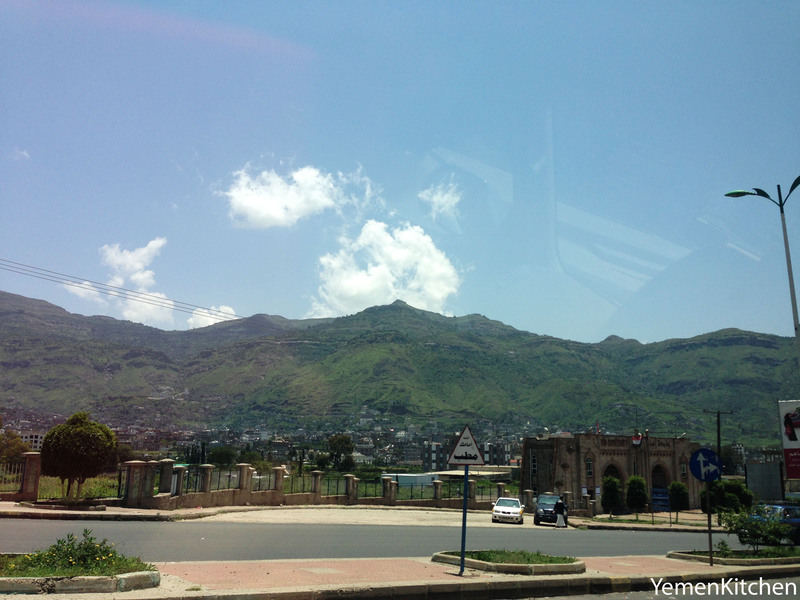 Once you survive the motion sickness from roads of Somarah ســــ’مارة, and Nakeel Thee-Yaslih نقيل ذي يسلح Mountains the scenery starts to open up into wide lush, green valleys. 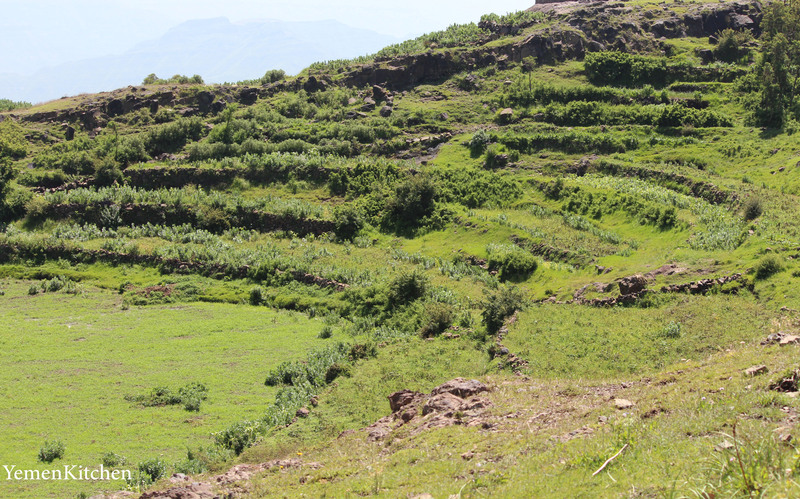 All organized into combed terrains .This is the green belt of Yemen, the place that historically used to feed people of the Arabian Peninsula. 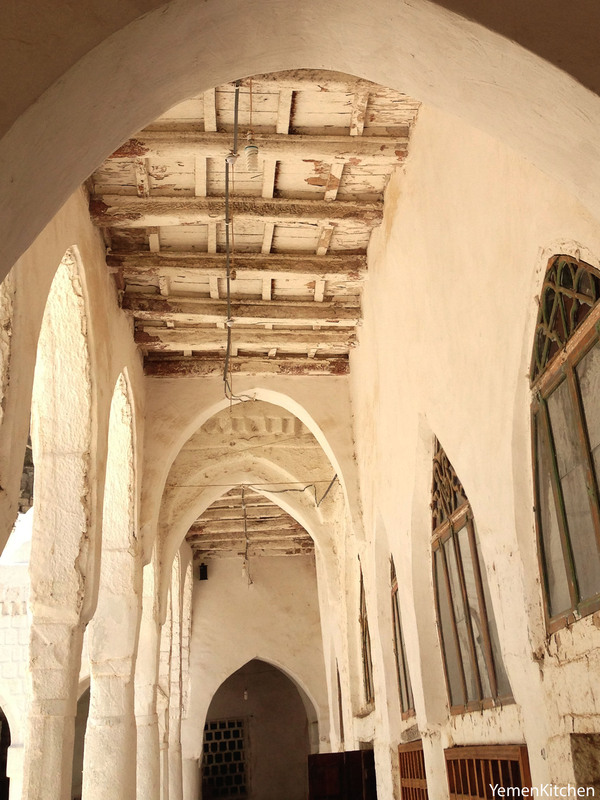 Ibb has the second most amount of rain per year after Salalah, Oman. Which makes it number one in Yemen. Most people of Ibb work on agriculture. 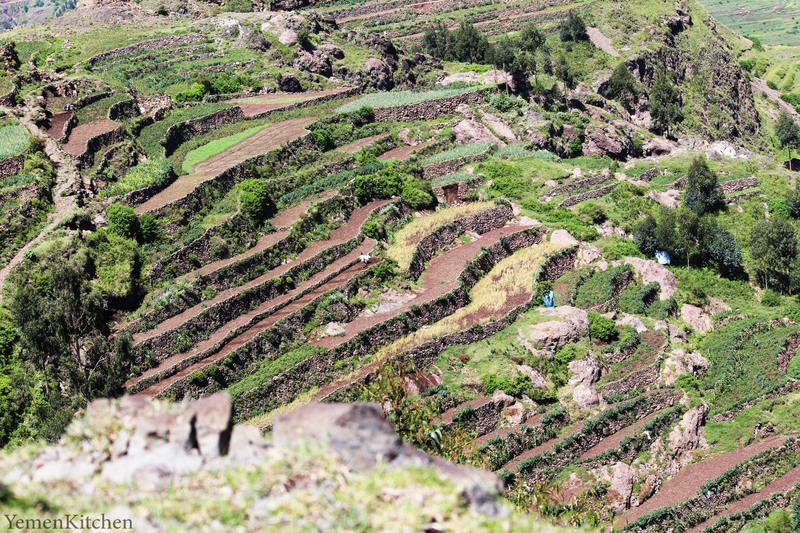 Crops like Corn, vegetables, and fruits grow fantastically here. People say wonders about the rich soil of Ibb, and it’s cool, sunny weather. 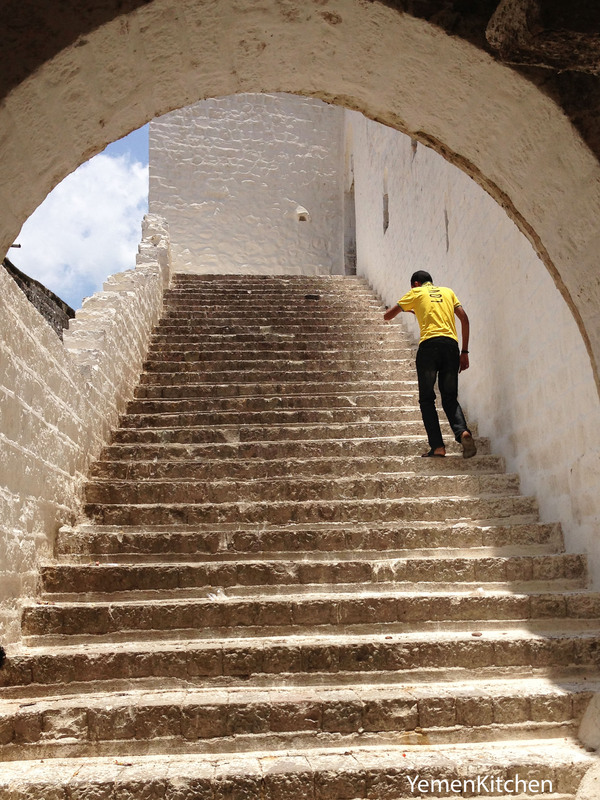 Each time I visit Ibb, I get out with a different understanding of it as a place. 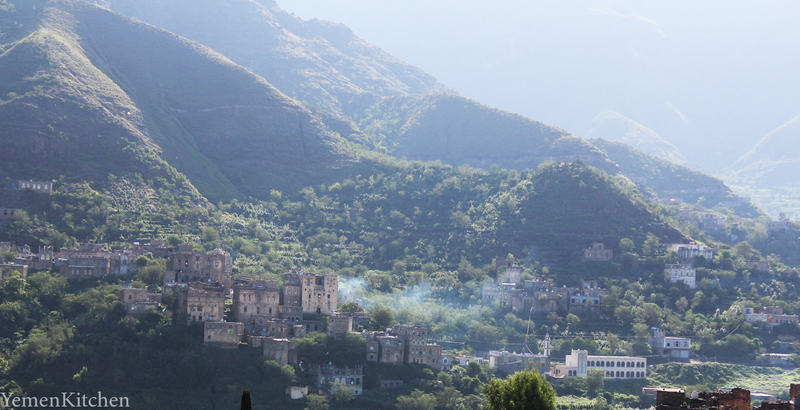 Ibb is famous for its green valleys, and lush mountains, but since the seventies, it became a big exporter for Yemeni immigrants to the U.S and neighboring countries. Whole villages had migrated and only old women and men were left behind. When I passed by the city this summer I was surprised by its urban growth that changed the town. Eclectic architectural styles are more obvious in the busy part of the city. Houses became bigger, using non local stone. The wealth that came with the waves of returned immigrants made changes in people’s tastes and lifestyles. Food in this area is very rich and delicious. 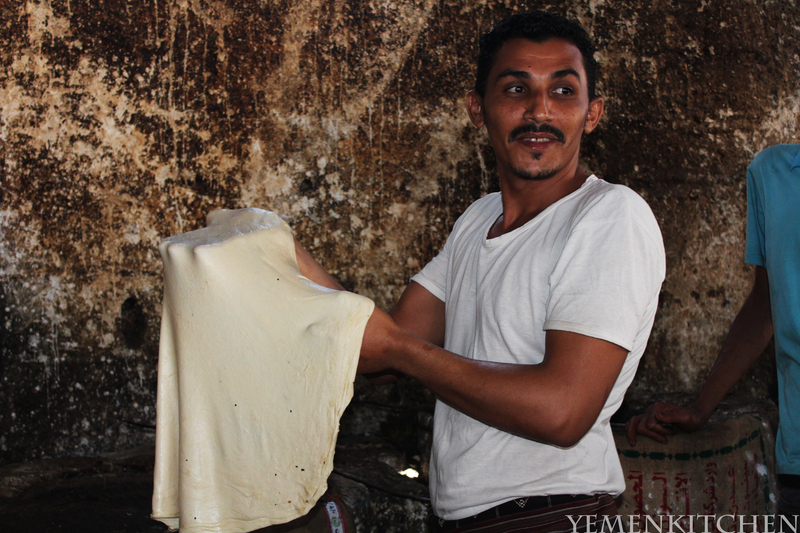 Grains, and dairy products are heavily used in the local dishes.Unfortunately, like any place in Yemen. If you want to try an authentic food experience, made to high standards, you have to eat it in a house, not a restaurant. It’s a very different food culture than in the west. Where there is a whole industry behind food cooking and serving. But that’s why you are here, right? 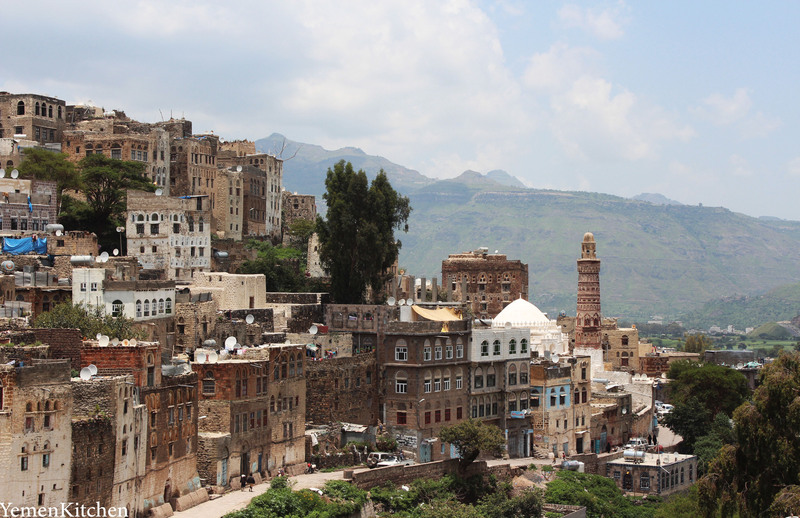 🙂 To get you some authentic Yemeni recipes, and learn one thing or two about Yemen! 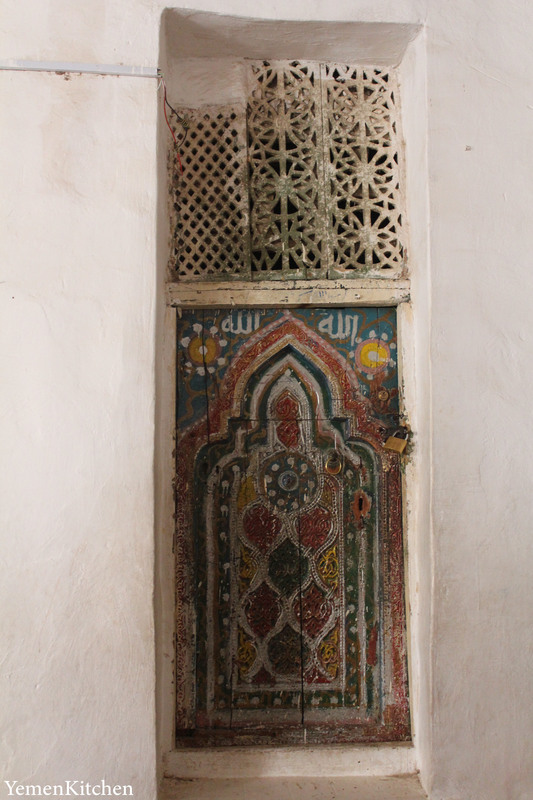 If you ever passed through Ibb, and wanted to explore it more, start with its historical heart, city of Jibla جبلة , where the Tomb of Queen Arwa Al-Sulayhi resides in peace inside her mosque الجامع الكبير. 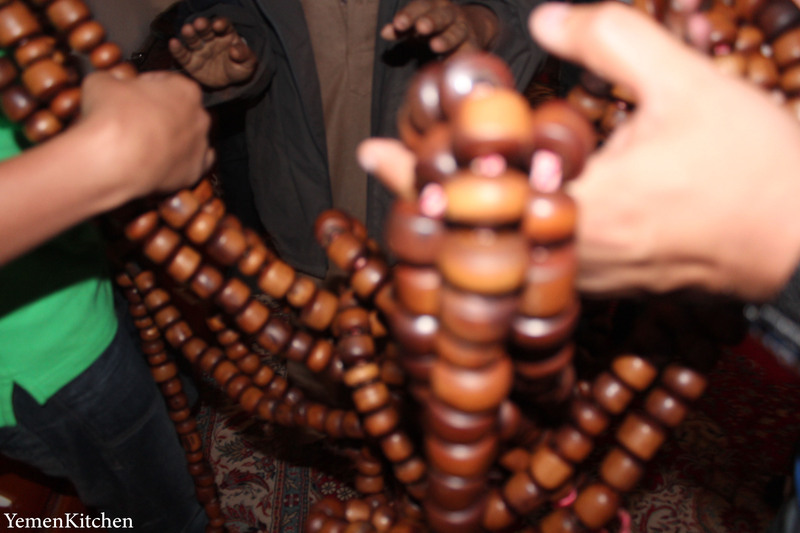 Couldn’t believe my eyes , when the Mosque’s manager opened a box and let us hold with our hand an artifact like this ! 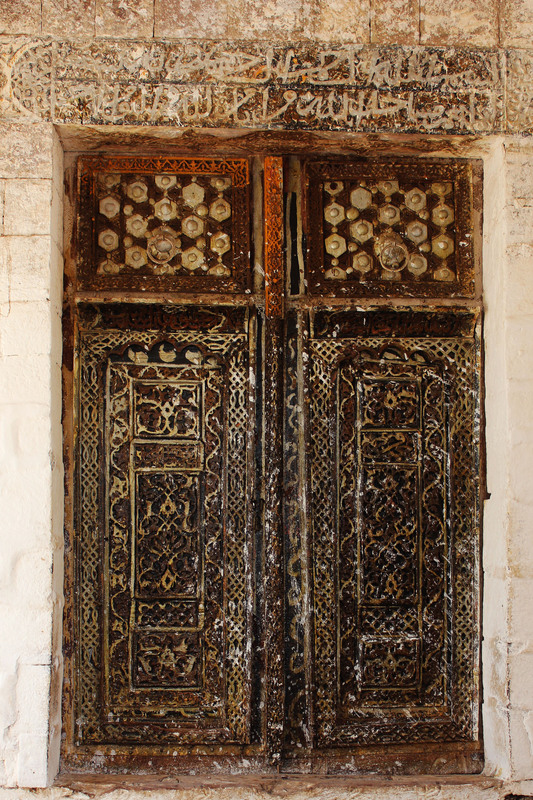 Queen Arwa is a well-respected historical figure for people of Yemen, her religious status as the head of Ismaili minority in Yemen, and the ruler of Al-sulayhid dynasty gave her fame and power that reached up to India, were there is a bigger community of Ismailis living there. 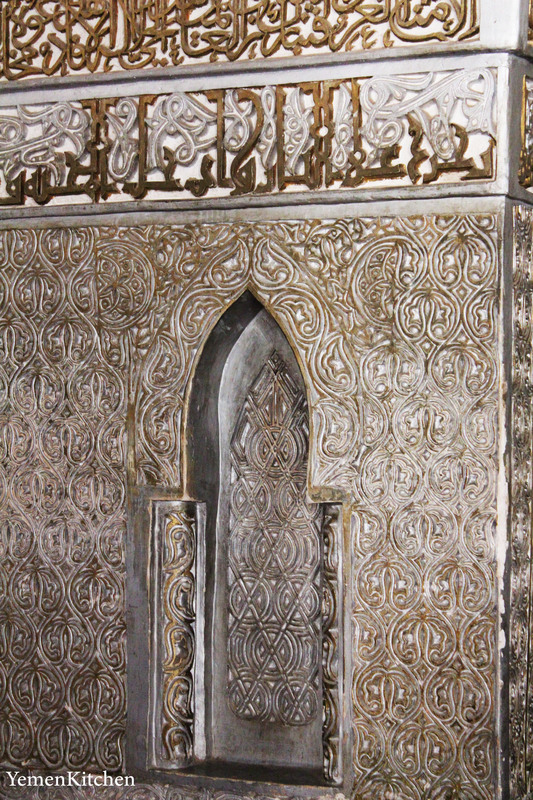 Until today, Ismailis from India and all over the world, pay her tomb a pilgrimage in Jibla every single year. I became a fan of Queen Arwa as a kid listening to all stories and myths around her, her beauty, and how she outsmarted her enemies with her intelligence. 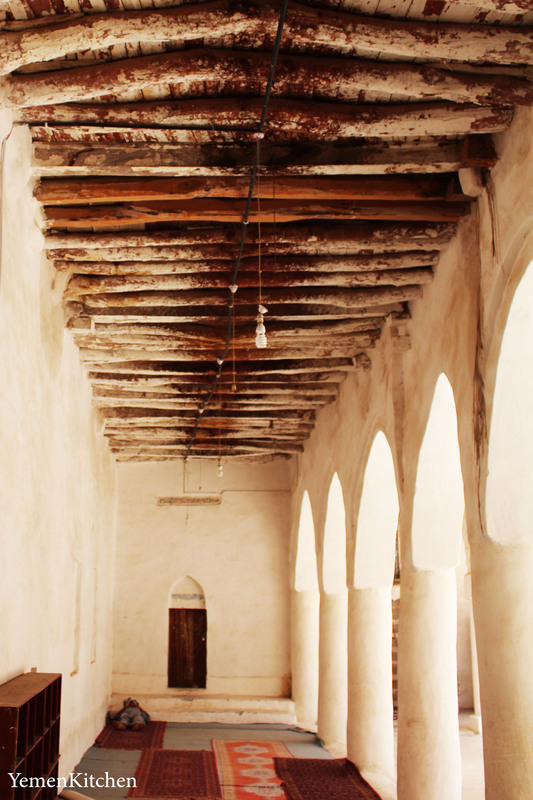 Queen Arwa was an orphan little girl from Al-Sulayhi family. 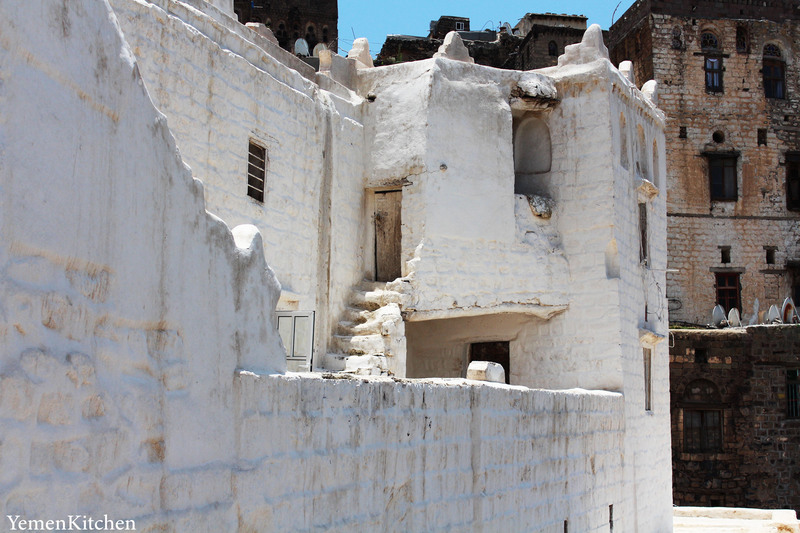 She was fortunate to get education at Al-Sulayhi Palace in Sanaa, she learned politics, poetry, and religious studies. She was famous of building schools and mosques. Today women in Ibb are struggling with issues such as lack of education, and early marriages, yet they still maintain great resilience and strength. When you go to the country side, you notice it’s culturally easier to understand than the city. Women are usually seen unveiled with colorful dresses and wearing hats made of straw or light fabric on top of their heads to protect them from sun. They work hard in collecting the crops, bringing water from nearby streams and yet still carve time to cook and bake meals for their families from scratch using their outdoor clay ovens and few simple stone and clay cookware. 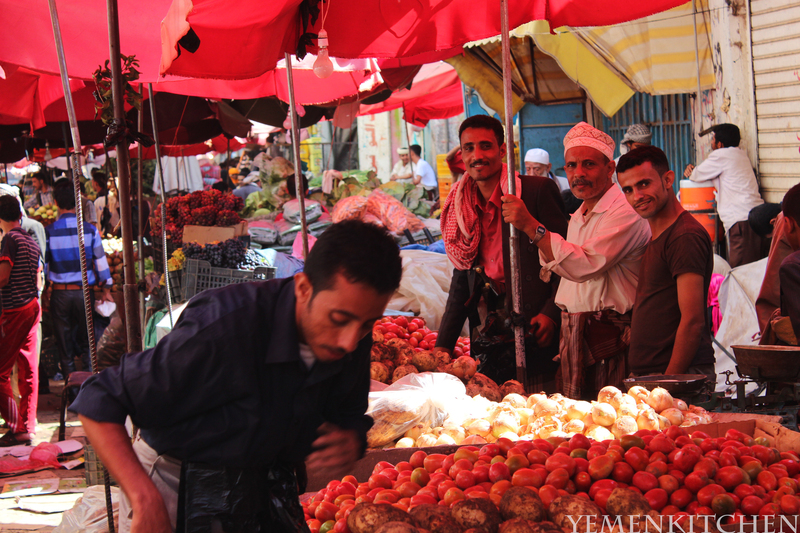 I remember them always happy and chatty with visitors, coming from Taiz, we were treated as guests. I can’t remember how many times I got invited by random people for a bite of freshly baked bread served with smoked butter milk. 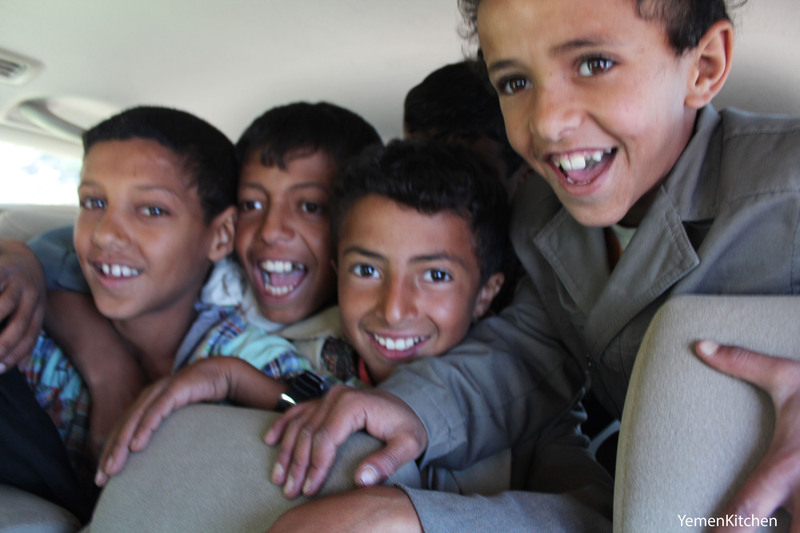 Some Kids that offered to guide us in our way to The-Sufal ذي سفال, a village in IBB. Kids here are witty, funny, and smart. They take responsibilities in working in the field and helping their families, and probably they would make better conversations with adults than city kids. They were so excited that we offered them a ride in our car and that we were using their expertise in the area to help us reach were we wanted to go. They were also very proud while talking about their lives in the village. We were surprised that they asked us for a ride. If anything it means it’s a very safe area, and locals are friendly with strangers. 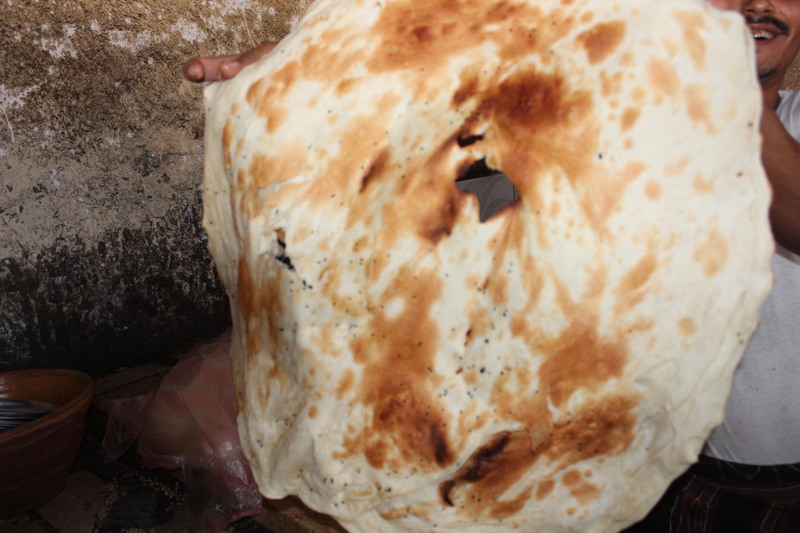 A popular recipe from this area is the Fateer Bread. 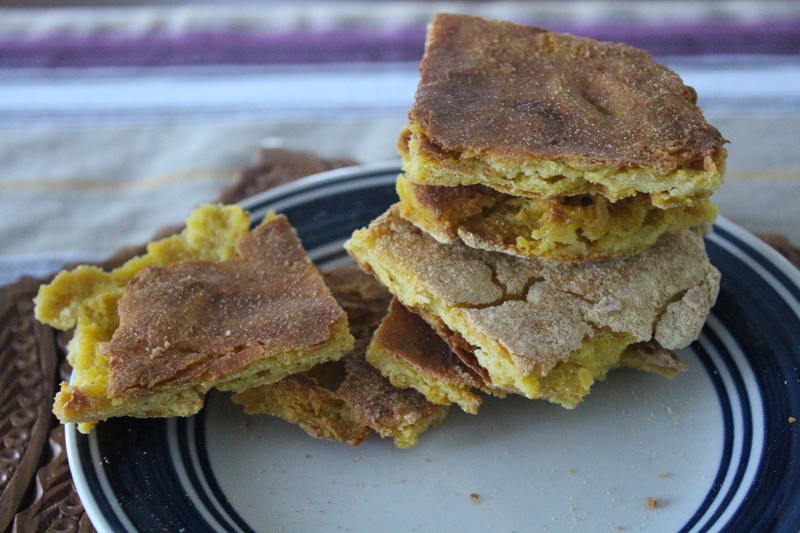 Almost every family has its own way of doing this homemade healthy bread. 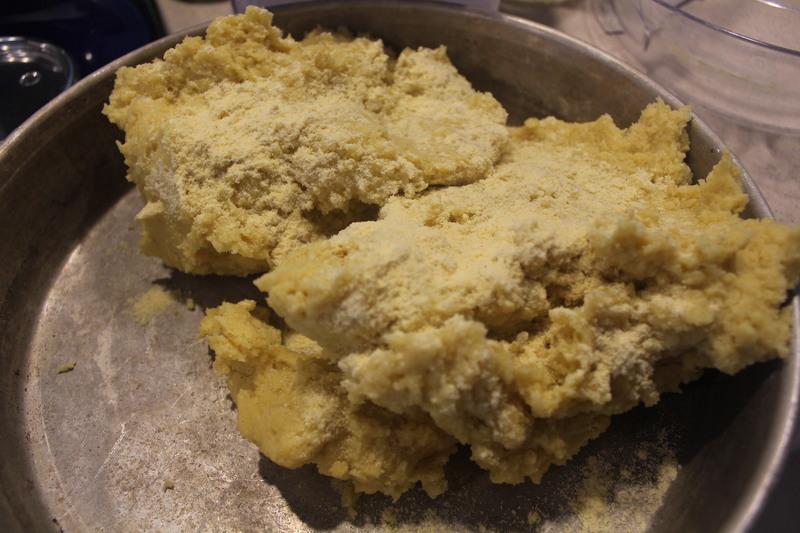 It’s usually done with one or a combination of Corn Flour, Pearl Millet flour, Wheat, lentil flour and White flour. What I noticed some people would like to add boiled potatoes within the dough or White cheese for flavor. The plain recipe is fantastic, so you can imagine how great it will be with the extra additions. 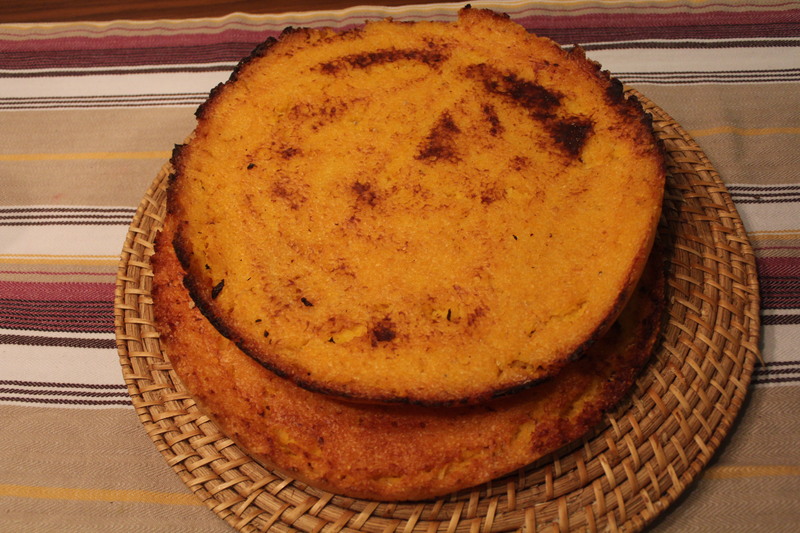 – Sprinkle some corn flour on a wide metal dish ready to go into oven. 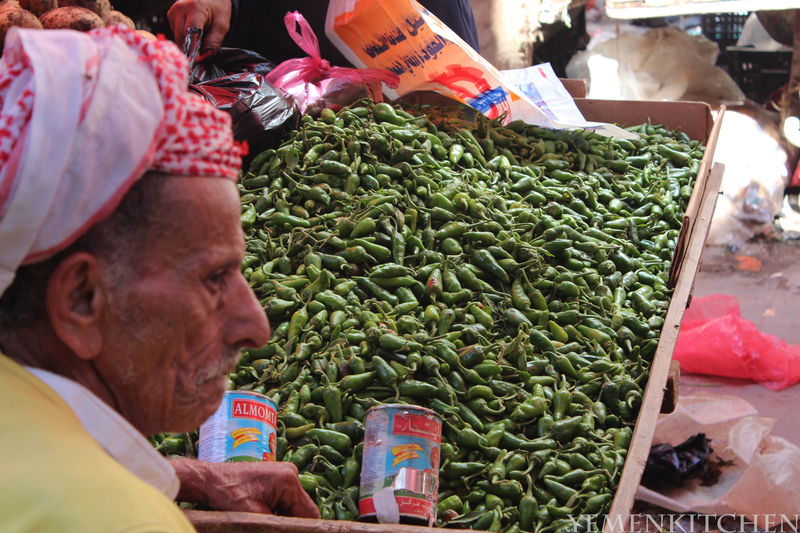 -Heat the oven to 400 F.
The first steps are similar to making Yemeni Aseed. -First Bring the water into boil and add the salt and oil. -Quickly, add the flour combination and start whisking with a strong wood spoon until the mixture start getting thicker, make sure there are no lumps! -After 7-8 minutes of kneading on the stove, the dough will get thicker and stronger, keep moving the spoon, and if it dried up add some hot water to the dough or few drops of oil. 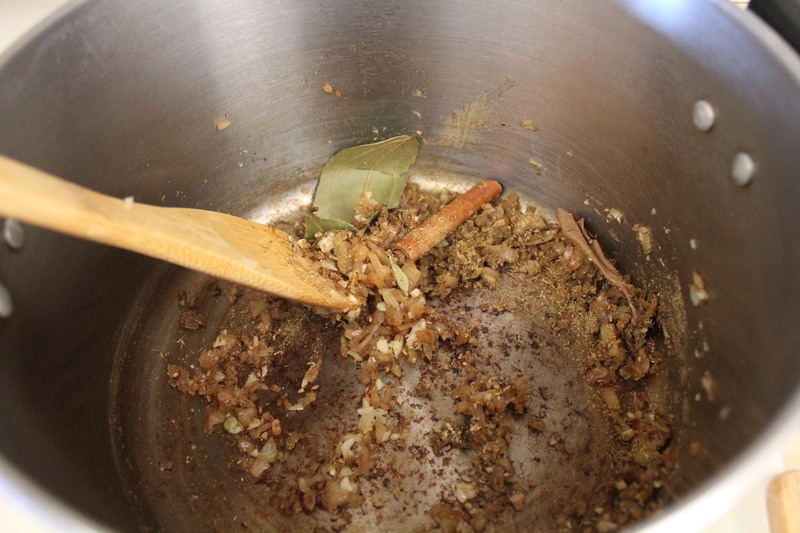 -Cover the mixture and let it boil under low heat for 10-15 minutes, then stir it one last time. 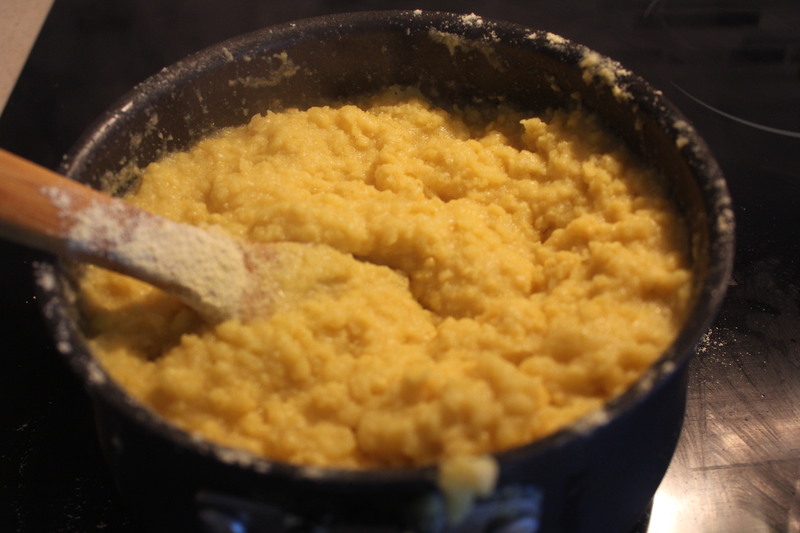 – Remove the mixture from the stove and put it on the dish. It will be very hot, so be careful. -Quickly put your wood spoon in the hot water and smooth the bread mixture into the dish in circular motion. Make sure all the side of the bread are equal in their thickness. The perfect thickness is around 2 inches. -Now your healthy, all made from scratch bread, is ready to go into the oven. -Wait for an hour, or until the bread is crispy from the edges, and golden brown from top before you get it out. This bread is great with Cheese, hot chili and yogurt, or could be eaten on its own with a cup of tea. 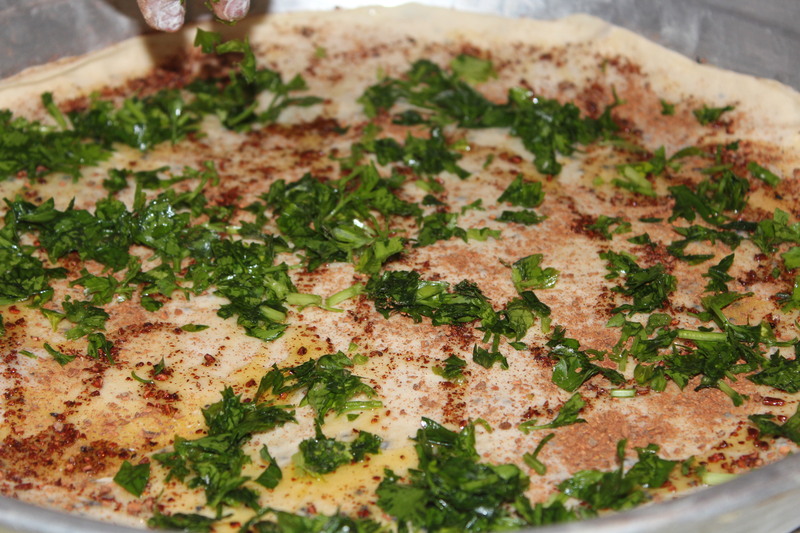 Boreck(börek) ’بريك..Layers and layers of goodness. 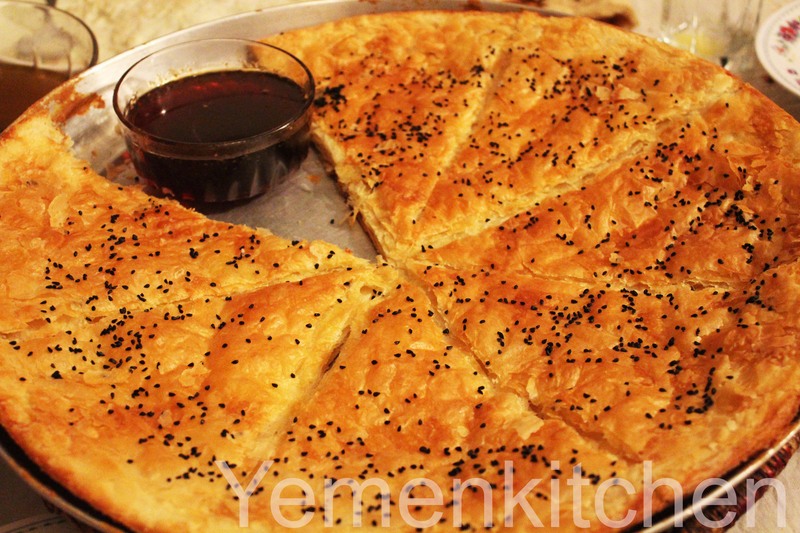 Yemeni borek is a traditional meal that is served for guests or in weddings,or fancy feasts, it’s definitely not an everyday meal for its rich ingredients and longtime preparation. 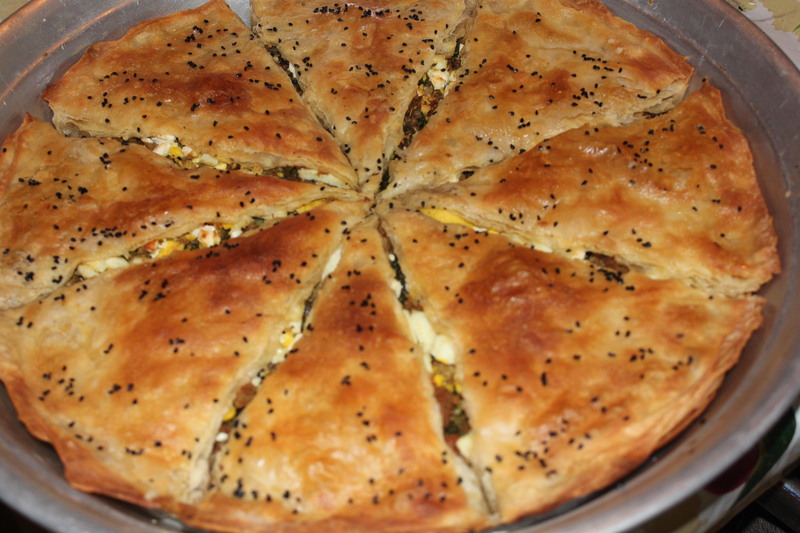 The Borek word has no Arabic meaning. It is a Turkish word, which simply means “Layers”. 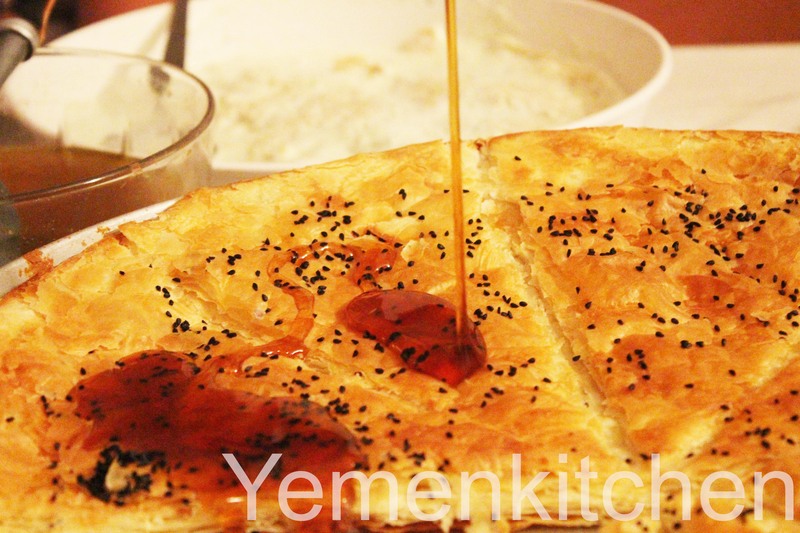 This meal is one of the Turkish influences on the Yemeni Kitchen. 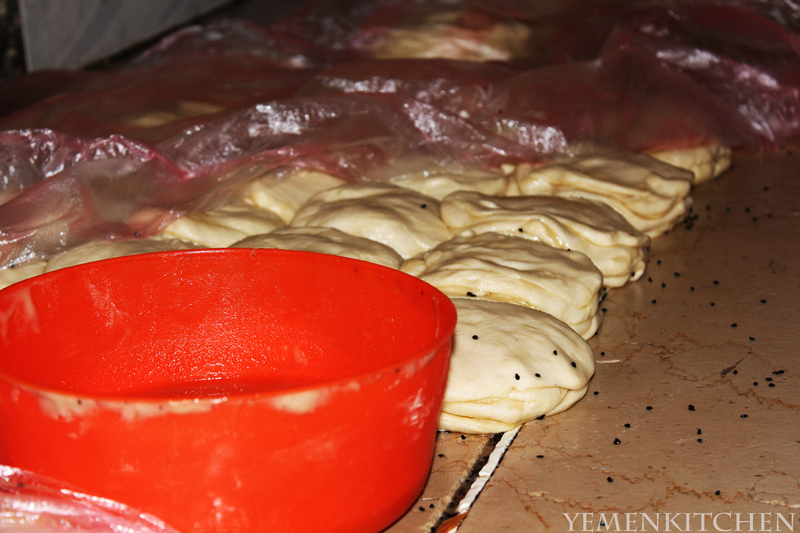 However, there are differences between the original Turkish borek and Yemeni borek in the stuffing, and the amount of layers. 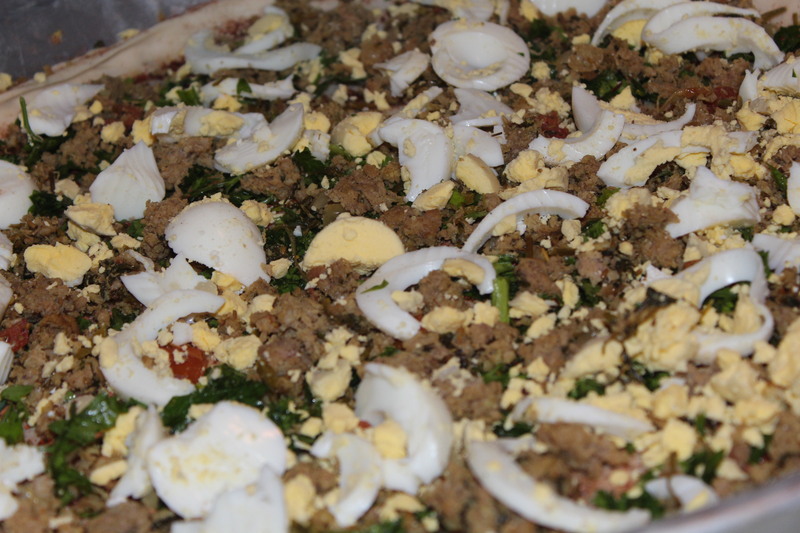 Traditionally, only rich families could afford it, since it is usually made of multiple of thin layers of dough, stuffed with several sources of proteins; ground beef, boiled eggs, cheese, and Parsley for taste. It is garnished with black seeds on top of it, and the filling is flavored with cinnamon powder for a final twist in your mouth. Boreck layers needs a great attention during its creation. Each layer has to be very thin and soft, with minimal cuts or wholes. It requires a skill to open the dough with both of your hands and throw it left and right in a synchronized movement until it becomes thinner and bigger and more round until it ends safely on the dish. 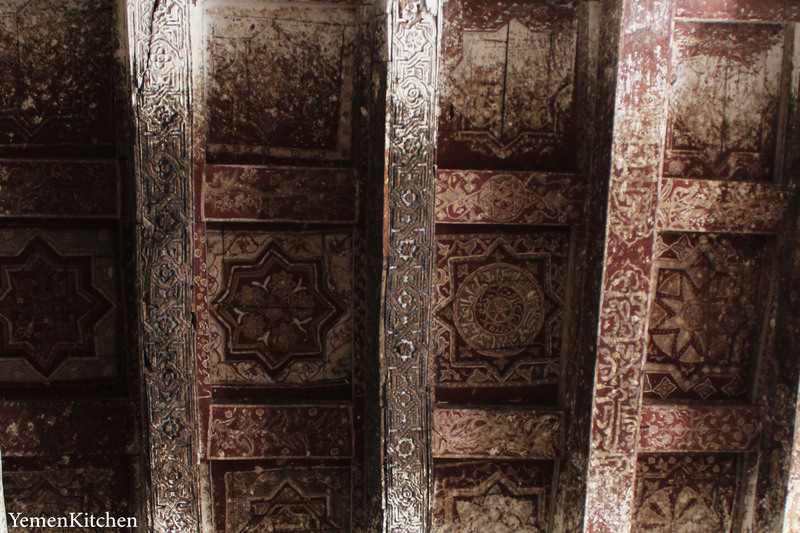 These layers are named “shanajat” in the Sanaani accent. 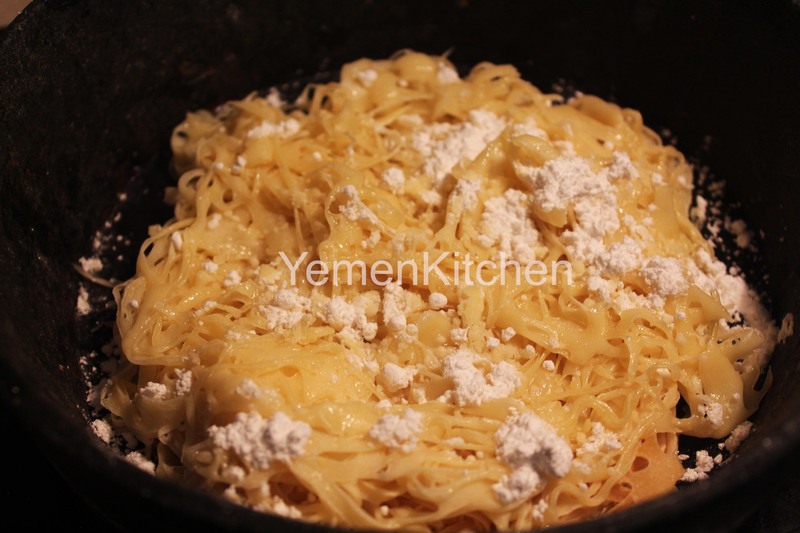 Boreck is also a cousin recipe of the very famous Yemeni dish Bent-Alsahn (daughter of the dish) except that the second includes backing powder in its ingredients, has no filling ,and served with honey on top alone. In my visit to Istanbul, I found many types of boreck some that is stuffed with cheese only, other with spinach and cheese or just beef; it was interesting to taste the different variations of it. 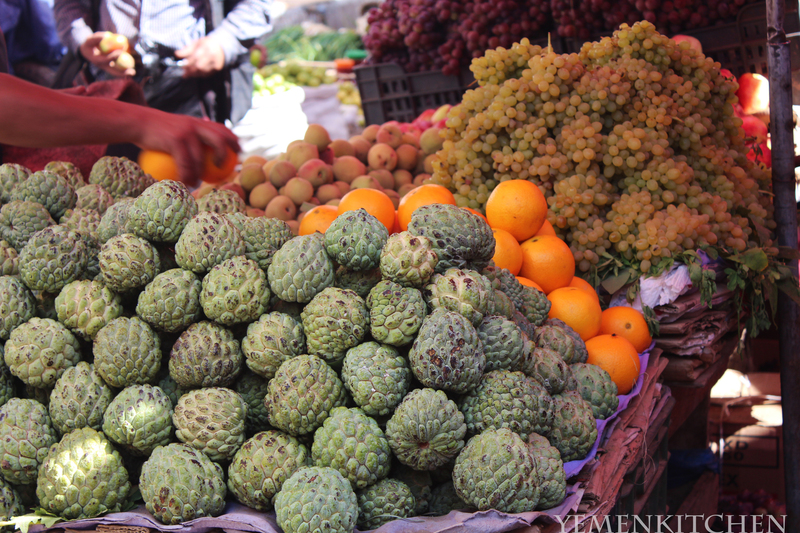 I was not able to taste one that exactly matched the one I know from Yemen. Probably my did her own combination of spices in the filling , and because she used Yemeni speciality smoked ghee. The boreck layers in the Yemeni recipe varies between crispy to tender but the ones I tried in Istanbul where very soft ,and way lighter, more like a puff pastry . Perhaps everyone in modern kitchens are using the ready to use packets of puff pastry and the original dough recipe is rarely used anymore since no one has the time to do it from scratch anymore. The dough recipe I have here is actually for the Boreck, and its an original one from my mom. What I like about it is that its easy and simple, if you have a dough maker machine you will get better results. I used my hands in kneading couple of times and it worked just fine, so I encourage you to use whichever you want for Kneading. 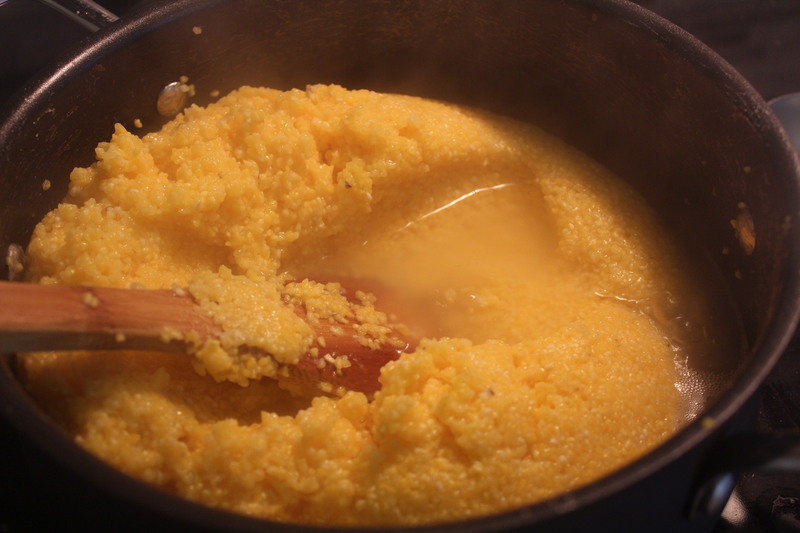 (you can exchange the ghee for canola oil for a lighter dish). ½ cup of crumbled feta cheese. Make a whole in the mix and put the egg. Add the oil and then the water very slowly until the dough starts to shape up. Watch out from putting more water; keep kneading for 10-15 mints until it makes a nice, soft dough. I usually know that the dough is perfect when nothing is sticking in the dish and all the ingredients are bonded to each other very well. Now put the dough to rest for 10 minutes and cover it with plastic cover. Later cut the dough for 12-15 equal small pieces. With your fingers press on the dough softly. Prepare the dish that will go to the oven by drizzling some of the butter/ghee mixture and make sure all sides of the dish are rubbed with oil. Now open up the dough , if you are still an amateur in opening dough to thin layers start rolling them just like pizza , then when it’s around 7”-9 “ inches in diameter you can start opening them . Focus your hands to be synchronized in their movement while pulling the edges of the dough out to become bigger and thinner. Now put the thin dough on the prepared dish, stick its edges to the dish .Drizzle the oil again and through some black seeds(if desired) on the first layer. Move the dish right and left to make sure the oil drops are moving around evenly on your layer. Repeat this process for the next layers. After repeating this process, you can start putting the filling. First, drizzle the Cinnamon powder on the layer. 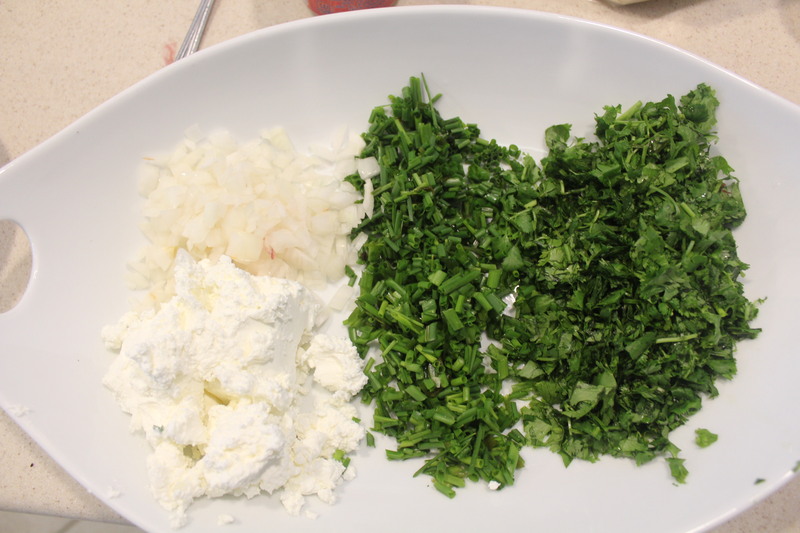 Second, put the ground beef, followed with Parsley, cheese and the chopped boiled eggs. I tried putting the stuffing once all together on the dish at the same time, just to save some time, but I didn’t like how it looked in between the layers( presentation wise ) when I started cutting them. Make another 5 or 6 layers on top of the filling .Make sure your final layer is the most beautiful one, with no holes or presentation problems. Drizzle with Butter again one final time and put some black seeds for garnish, yes , it’s a very rich dish, but its taste is worth the calories!. Later start cutting them into triangles, just like pizza, and let it settle down for 15-20 minutes while waiting for the oven to get hot at 350 f.
Put into the oven for 35 minutes or until its golden brown, remove and serve immediately. 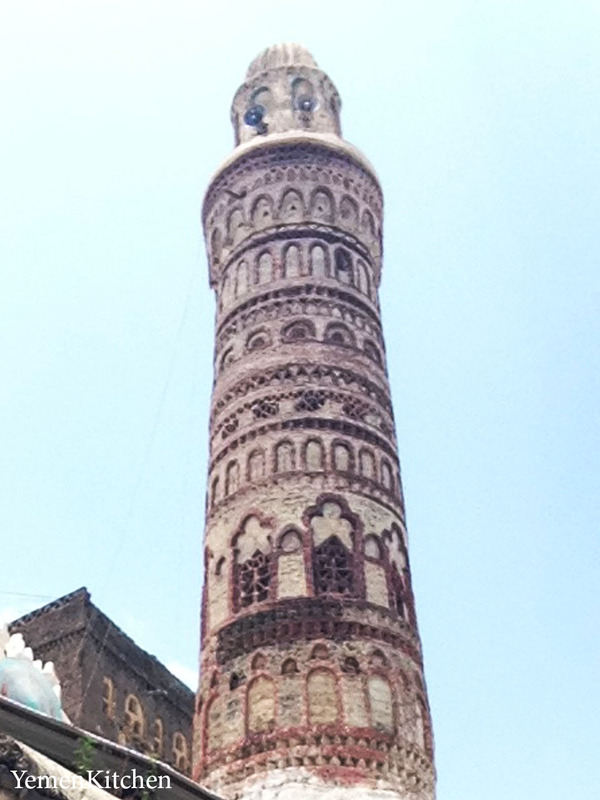 I was delighted to be invited to speak on how Yemenis observe the holy month of Ramadan and the holiday of ‘Eid al-Fitr’ on Mafraj Radio. 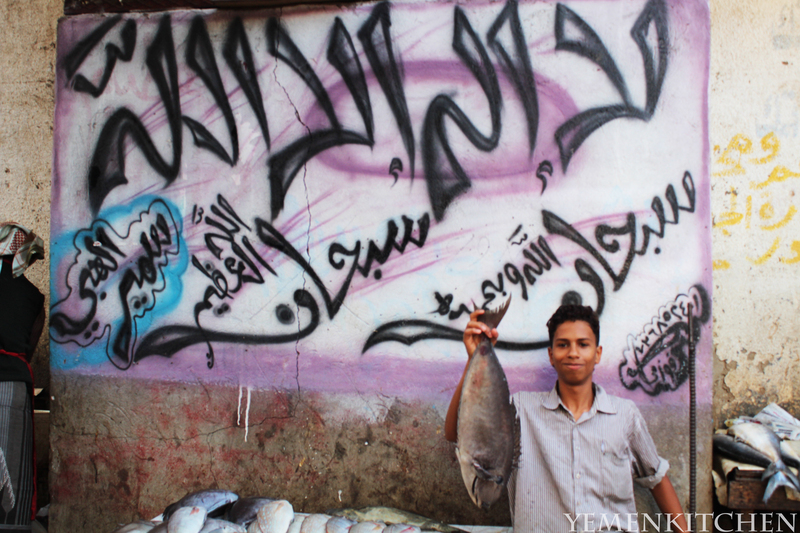 Mafraj Radio is a podcast organized by Will Picard, founder of Yemen Peace Project. If you are interested in Listening to the Podcast Please, check this link ,my interview starts at 28:57 sec. of the video.